The Situational Leadership Model is one of the most practical leadership theories for Project Managers. As a Project Manager, you'll find that you usually have little to no direct authority over the members of your project team. As a result, your ability to influence others is a major determinant of your success. The Situational Leadership Model, developed by Ken Blanchard and Paul Hersey, provides you with a framework that you can use to determine what type of leadership style would be most effective based on your followers ability and willingness to perform the desired task. The basic premise of Situational Leadership Theory is that there is no one "best" way to lead a team. In other words, the leadership style you should use should be adjusted based on the situation. More specifically, it is dependent on the "maturity" of the specific follower you are trying to influence. Follower maturity is divided into four levels ranging from low maturity to high maturity. Maturity can also be thought of as a followers readiness to be led. It is based on their ability to perform the task and their willingness to perform the task. The group or individual is not able and not willing to do the given task. The group or individual is not able but willing to do the given task. The group or individual is able but not willing to do the given task. The group or individual is able and willing to do the given task. The type of situational leadership style you use will be based on your followers maturity level. 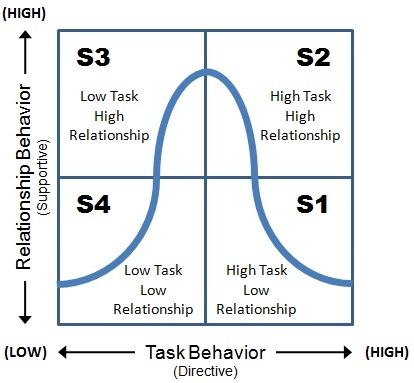 Each leadership style is a combination of "task behavior" and "relationship behavior." Task behavior refers to the amount of direction a leader provides to his followers. For example, telling them what to do, how to do it, when to do it, and where to do it. The Situational Leadership Model defines four leadership styles. The style you use is based on your follower's maturity level. Followers are both unable and unwilling to perform a task. As the Project Manager, you will need to provide clear directions and supervision. Making sure roles and responsibilities are clearly defined as well as explicitly telling your followers what, how, when and where to perform specific tasks will help you be successful with Low Maturity followers. Supportive behavior should be minimal as it can make you seem too easy and rewarding of poor performance. Followers are unable but willing to perform a task. 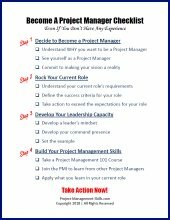 As the Project Manager, you will need to provide direction since their ability is low. Additionally, you will want to reinforce their willingness and enthusiasm by providing supportive behavior. For example, explaining why the task is important and needs to be done. Followers are able to perform a task but lack the self confidence or enthusiasm to do so. As the Project Manager, your supportive behavior should be high. Facilitating actions such as active listening and sharing in decision-making should be emphasized. Followers are able to perform a task and are motivated to do so. As the Project Manager, little direction or support is needed. Followers are very self-directed at this level and are able to make their own decisions. Because of their high level of motivation, they also do not need a lot of supportive behavior. In larger projects, individuals at this level of maturity are often sub-project leads or team leads. The key to using the Situational Leadership Model successfully is understanding the maturity level of your team and it's members. Once that is understood, the model provides the guidance to determine the appropriate leadership style you should use. Understanding what makes a good leader is important if you want to be a successful Project Manager. Learn the two key characteristics of a good leader. Leadership versus management - Is one more important than the other for successfully managing projects? Learn the difference between leadership and management and how it applies to project management. Situational leadership theory is a powerful model that project managers can use to be successful. Learn how you can determine the most effective situational leadership style to use for your situation.